The philosophy of Yes, And is where an idea builds incrementally using a collaborative ensemble approach. Each collaborator in the ensemble (in our case prisoners and musicians) adds to a conversation while focusing on the group momentum instead of an individual end result. The outcome generates something greater than if one single person guided the direction of decisions or opinions. And that is the fun part of the whole collaborative conversation. We discover the outcome by adding to each other’s ideas. When we first started these recitals, the music we shared started the conversation. The prisoners with poetry, painting, and stories continued that conversation. Then the conversation was added to by the outside world. I shared their art, their thoughts, and their words in my blog and on social media and then it triggered more responses from artistic communities around the country. Composers responded to prisoners’ thoughts and paintings with new works of art reflecting on the most recent ideas from the prisoners. And back into prison went those ideas for the continuation of the idea/conversation. There never was a set goal or set destination. Had there been a specific goal from the beginning the endeavor would have failed after two concerts! What is so great about art and music is much of it says things better than words could. The conversations from behind prison walls to society and back are all through music and art. They are well wishes, support, help, apologies, and so on. And they are ongoing. Bringing music and continuing the conversation as prisoners prepare to return to society has been a great joy for me and the people who’ve helped me along the way these past two years. We’ve all experienced how music and art are relevant in healing, empowering, and helpful in coping with challenges. We’ve felt how humbling it was to share artistic conversations with an incarcerated population. As we continued with many follow-up concerts, we quantified the importance and impact with each visit. It was time to take this initiative to the next level. In May of 2017, I started the process of forming a 501c3 nonprofit corporation. A board was formed, and 36 intimidating pages of the application was waiting for approval by June! 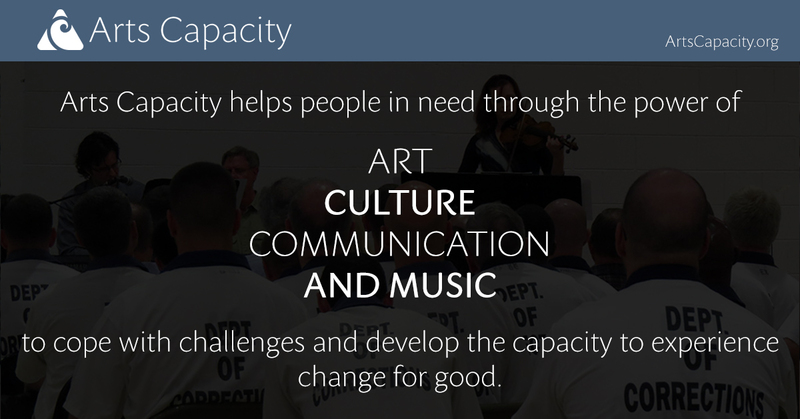 In late November, the new nonprofit, Arts Capacity, was official! Yes, And let’s see how we can make this work. Yes, And I believe I have contacts in that area. Yes, And if we collaborate with XYZ, we could have wider participation. Yes, And-ing from the beginning allowed for creativity to flow and process to be optimistically yet realistically handled. No idea was shut down. The flexibility was our super-power. Arts Capacity is young at this point, but the direction we are going will perpetuate the conversations we’ve started. That conversation of hope, coping, caring, and support will not necessarily save the world, but the impact will be felt. Hopefully the small pebble we just threw in the pond will ripple with exciting opportunities as we continue. Our next trip into prison will be following what has been successful the last several visits. We will be taking living composers’ works to the stage, offering world premieres in a place that doesn’t usually get that privilege. We’ll also be taking the composers in to the prison. We will be sharing music and listening to the impact from our future neighbors. We will share their impressions and keep that conversation going. Basically, letting Music and Art guide us all into a better conversation. If you would like to be a part of that conversation and/or wish to donate, there are many ways to follow and/or give. Donate online at ArtsCapacity.org or mail checks to Arts Capacity, P.O. Box 3636, Chattanooga, TN 37404. All donations will be acknowledged with a receipt for your tax records. Updates and follow-ups will be shared on the Facebook page for Arts Capacity. We are already looking forward to sharing our next recital in a few weeks! Yes….And! Your blog expressed so beautifully what has been accomplished over the past two years and what is to come in the future! I am honored to be a small part of the adventure and look forward to continuing to support you and ARTSCAPACITY.